Scientists at Emory University have concluded that dogs have at the very minimum a basic neural representation of the meaning of words they've been taught. They differentiate between words they know and those they've never heard before. This is one of the first studies using brain imaging to study how dogs process words associated with objects. We all know dogs learn to understand and obey verbal commands. But there is no substantive scientific evidence on how they do it. 11 dogs joined Eddie, pictured above, in the Dog Project, along with their owners. The dogs were trained to voluntarily enter an MRI and remain motionless without any sedation while scanning occured. 2 objects, a stuffed animal and rubber toy, were used to monitor how the dogs associated the objects with words. 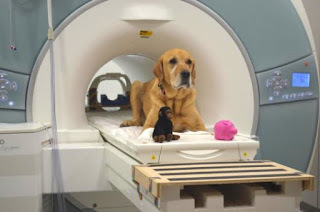 The MRI's showed the auditory region of the brain showed greater activation on words the dogs never heard before, as though they were efforting to understand it. This is ongoing research and the beginning of the difficult process of mapping and understanding cognition in dogs' brains. But the scientists have already concluded that dogs have neural representation for words they've been taught, well beyond the Pavlovian response.